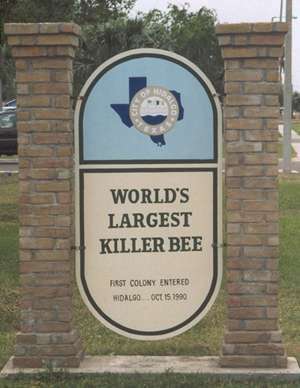 World's Largest Killer Bee, Hidalgo, Texas. 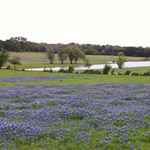 At 704 East Texano Dr. in front of City Hall. Between 7th and 8th cross streets. The much anticipated "killer bees" may have entered the United States here from their long trip from Brazil, but this (slightly) oversized specimen comes from Sparta, Wisconson where it was sculpted by Jerome Vettrus. Many people are surprised when they learn that this sculpture was not commissioned by a fine arts group, but rather the Hidalgo Economic Development Department. Made of fiberglass over steel, the bee is actually portable so that people not fortunate enough to have their own oversized roadside attraction, can still experience one. 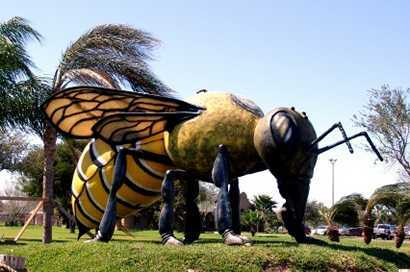 The Killer Bee is now the official mascot for Hidalgo and is included in the excellent A Comprehensive Guide to Outdoor Sculpture in Texas by Carol Morris Little, (UT Press) from which this information is gleaned.